The layout is based on a "what if?" scenario where the Alphabet Route railroads were allowed to combine into a system as an efficiency move during WW II. (This is similar to the Family Lines during the 1980s where several railroads painted equipment in the same scheme even though they were not legally one entity.) So there is equipment of the combined Allegheny & Western system along with equipment of the member roads. The modeled A&W mainline runs from the Port of NY to Harrisburg, PA. There are two major subdivisions branching off from the main. One goes from Phillipsburg, NJ to Maybrook, NY. The other goes from Topton, PA to Wilkes-Barre, PA and beyond to Buffalo. The hub is Allentown, PA, a midsize city with a large manufacturing base. Real locations are modeled, including Fleetwood, PA - original location of the "Body by Fleetwood" plant. Greenville in Jersey City, NJ - busy waterfront with a refinery and car float operations. Bethlehem, PA - the main Bethlehem Steel works. Allentown, PA - our company offices and our main yard, a modern rider hump. It is also the terminus for short-distance service to New York. Harrisburg, PA - our connection to the PRR system as well as the gateway to the south and southwest. Wilkes-Barre, PA - a rich source of traffic in anthracite as well as connections to the north and west. It takes a lot of people diligently working to keep a Class One railroad fluid. From the switcher plugging away at the docks to the trainmaster overseeing it all, there are a wide variety of jobs. Op Session Sunday 9:30AM Hicksville 9 mi., 20 min. The Bacardi and Northern Railroad is a fictitious revival of what is currently known as the CSX Northern Industrial Track between North Bergen, New Jersey and Orangeburg, New York. Based in the late 90s, the line is an almost exact duplicate of each of the industries that existed along the line at the time, providing extensive switching operations that will prove both challenging and fun. Modeler's license adds to the mix with a variety of run through freights, local passenger service and additional industries. The line is operated with a mix of first and second generation Alco power and standard freight equipment. Nearly all prototypical structures and scenery are in place, fitting the layout to northern New Jersey where the actual line exists. Op Session Friday 7:00 PM East Rockaway 7 mi., 20 min. Moderately hilly terrain 1958 New expansion! The Chichester and Sweet Hollow RR is loosely based after the Middletown to Willimantic segment of the New Haven RR. This 1:29 scale railroad is designed for true timetable and train order operations. You can't see the next siding from most locations, so you have to be sharp! A reservoir under construction near Barnesville is providing a small percentage of its fill to assist the C and SH convert an old trestle into a fill. Until the trestle over Sweet Hollow gorge is back in action freight traffic is being offloaded at Sweet Hollow Industrial Transfer Co. where trucks swarm around the loading platforms. Traffic is heavy here and demands much of the crews. The sounds of a busy transfer depot are heard throughout the valley. (SHITCo. Is some twelve feet long with its own sound system. The year is 1958 and the important terminal grain elevator at Sweet Hollow is struggling to handle the burgeoning traffic. Local collection elevators fear giving up their PS-1 boxcars out of concern that they will not be replaced. At Sweet Hollow covered hoppers are being loaded at a rapid pace allowing the now more primitive boxcars to be returned to smaller local elevators. Grain is being sorted and transferred to brand new 100 ton hoppers while grain doors are being removed from the forty footers that will soon be taken out of grain service. But it is the harvest and there are never enough cars to handle demand. This layout now in its sixth year has pioneered many new construction methods. It is 2000 feet long with a new terminal facilities at Barnesville, our connection to the rest of the national rail network. In case of inclement weather, we will operate the Great Lakes & Iron Range indoor layout. Please see that description for details. The D&S is a proto/freelance layout loosely based on the Lehigh Gorge area in Pennsylvania. The railroad is centered between Wilkes-Barre and Allentown, with each city having a large classification yard. The single track main line is fully CTC controlled with US&S type S signals (searchlight), communications are FRS radio when needed. Traffic is widely based, dense and typical of the modern era of “ double stacks, TOFC, unit coal, ethanol, and trash trains along with heavy manifest traffic going into the New Jersey, Philadelphia and south eastern US from New England and points north west. There are many locals and serious switching, as well as block swapping and other work. The Great Lakes & Iron Range is a freelanced ore hauler based on the Upper Midwest with some urban flair thrown in. A huge ore dock with full size lake boats alongside is one of the highlights of this layout. We are John Deere fans, so a plant is located online as well as many other substantial industries including a busy urban waterfront. We use NCE DCC for train control and the scenery is 75% complete. There are two yards and ample staging to keep operators on this layout happily busy. Op Session Sat 9:00 AM Huntington, NY 17 mi. 35 min. Handicapped hostile 1950's and 60's New expansion! My layout is a freelanced design loosely based on the Great Northern RR in Minnesota late '50s and '60s. The main yard is St. Cloud with additional towns of Hinkley and Elk River. I use the standard car cards and 4 position waybills along with a train order card. My operating session is laid back and consists of one east bound turn from Minneapolis (staging) to St. Cloud and one west bound turn from Duluth (staging) to St. Cloud. Operations consist of local and yard switching. I also have a mine branch run, along with passenger and reefer runs. I dispatch with verbal train orders. Jobs would be: 1)yard master (local pickups and delay, sort arrival and departures and turn locos on Turntable); 2) Road turn - (local pickups and drops at two towns); and 3) mine run (empties and loads) , reefer run, and passenger train. I have recently added a connecting RR room to my Great Northern. It also consists of a helix and three decks. I describe it as the Burlington Northern connection. The Superior WI yard on the lower deck interchanges with the GN yard. It has an eight car barge, interchanges with CN and St Paul. And two local turns from Winnipeg thru 5 towns also using 4 step waybills and car cards with pictures. Not yet scenic. Op Session Sat 9:00 AM St James, NY 33 mi. 50 min. The New York Central now has dedicated staging instead of a fiddle yard. Both The Erie and Lehigh Valley car float yards are fully operational and ready to go! The New York Harbor Railroad represents a mixture of urban and rail marine railroading in the West Side of Manhattan. The original plan called for an operating layout based on a four city block segment of Manhattan that included the New York Central, Erie and Lehigh Valley railroads. In addition to their own customers, all three railroads interact at a single location on the layout, Terminal Stores. Terminal Stores is a massive multi-story, city block size structure that was built in the 1890s and it is still standing today. Equipped with two sidings and twenty-two car spots, Terminal Stores is a very busy location. The railroad operation is based on a published 1947 New York Central timetable and is governed by a 2.5:1 fast clock. The New York Central has three major components. Component one is the 33rd Street yard, which interacted with the Erie and Lehigh Valley at Terminal Stores. 33rd Street yard represents about one eighth of the total yard or one city block. It normally requires a three person crew consisting of Engineer West, Engineer East and a yard master. The second component is the 30th Street Branch which is today referred to as the High Line. This is slightly longer than a scale mile in size and is served by two or three road crews. The crews handle everything from Mail to the BN-2 Pacemaker fast freight. Finally, the third component, St. John‘s Park Freight Terminal is the eastern most point on the branch. This structure is one of the first super Blocks built in New York City and is modeled track for track. The model required a fifty percent reduction in size from the prototype. St. John’s has a crew of one or two and is responsible for getting the cars out on time and spotted in the correct locations. 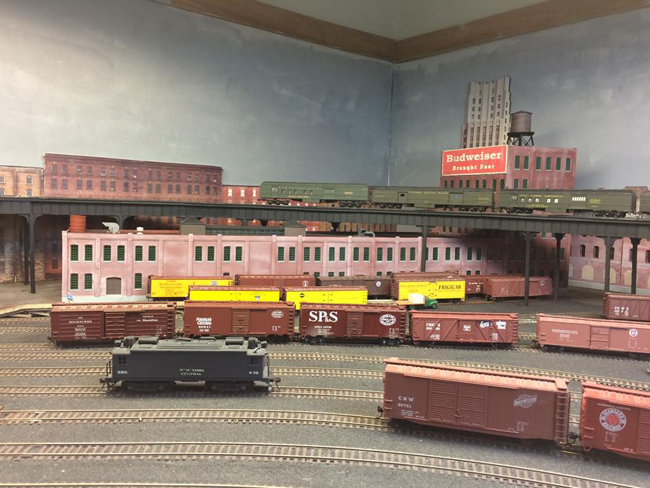 All of the traffic on the New York Central originates from and eventually returns to the new dedicated staging yards representing 72nd Street. The New York Central operates via a waybill only system. There are no car cards. The waybills are pre-printed and when ready for use a car is assigned to the waybill by simply writing the car initials and road number in the allotted spot. The waybills are double sided and govern the car over the railroad. The Erie and the Lehigh Valley terminals are faithful replicas of the actual trackage in HO scale. Switching in each terminal is packed into a city block with connections to the outside world via carfloat. These terminals have a crew of three, consisting of a Station Agent, Engineer and Conductor. The Station Agent is responsible for the loading and unloading of the car floats from storage as well as writing up the switch list and waybills for the Engineer and Conductor to follow. Waybills on the Erie and Lehigh Valley are only for cars going to Terminal Stores, the rest of the traffic is controlled by switchlists prepared by the Station Agent. The Engineer and Conductor execute the switch list and actually move the cars on to and off of the float. The layout is located in a basement and is not handicap accessible. There is no parking on the street until after 10:00 AM. There are no duck unders to enter the layout but there are four lift outs. One connects Terminal Stores to the New York Central, Terminal Stores to the Lehigh Valley one crossing the bathroom door on the High Line, and a highly-engineered double deck liftout that connects to NY Central staging. The New York Harbor features NCE radio throttles as well as tethered throttles. I also incorporated WiFi throttles running on iPhones and Android base phones. The WiFi throttle app is available free on iTunes and the android market place as WiThrottle Lite by Zemies Unlimited. It's 2018, and the NPSF has purchased a secondary line in New Mexico from the BNSF. The NPSF has a substantial subset of all modern railroad traffic running across its well maintained route through the desert, and the city of Albuquerque. Passenger trains from Amtrak and RailRunner compete for track space with unit trains, mixed manifests, coal drags, ethanol trains, and local switch runs. The NPSF is proto-freelanced, based on the practices of BNSF. The layout is double decked, and the desert scenery is 95% complete. The railroad uses NCE DCC with radio. Trains are dispatched via verbal train orders, and local frights use switchlists to direct car movements. Op Session on Friday 7:00PM New Hyde Park 4 mi., 10 min. The Stone Canyon Railroad is a fully operational freelanced single deck layout based in the western U.S. Timeframe is 1950's steam/diesel transition era. UP and ATSF are the predominate roads. Overall layout size is 26' x 39' including staging. The mainline is 200' double track closed loop plus 120' of hidden staging that can accommodate up to 10 pre-staged trains. Scenery is 100% complete and ranges from rugged mountains to a complete lighted city scene. The SCRR has expanded this year with a new logging branchline. DCC is Digitrax Super Chief Duplex Radio. Throttles will be provided. Motive power includes a variety of steam engines as large as 4-8-8-4 Big Boys. Diesels include switcher and road units along with E and F units for passenger operation. Operations include passenger, local freight, coal and through freight. Switching opportunities include a coal mine, lumber industry, over 30 industries, six towns, a large freight yard, lumber branchline and a full service steam/diesel engine facility that includes a 130 ft. turntable, 12 stall roundhouse and diesel shop. A typical 3 hour operating session involves the movement of approx. 200 cars, 18 locomotives and up to 12 trains. Operator positions include; Dispatcher (layout owner), Yardmaster, Motive Power Hostler, Engineer and Conductor. Communications between dispatcher and operators are via radio/headsets (provided). Car forwarding is done with car cards and waybills. In addition to the dispatcher, a minimum of 5 and maximum of 8 operators are required. The layout has hosted over 65 operating sessions since 2013 and has participated in every IslandOps weekend. It's proven to be enjoyable for everyone who's visited. ICRR has an urban setting during the steam to diesel transition era. Most switching is performed by diesel road switchers. OPS sessions include main line, coal hauling, yard operations, and limited branch line runs. The ICRR is freelanced and 100% scenicked. The layout is NCE DCC equipped. The ICRR was featured in the May 2012 edition of Model Railroader. A track plan of the layout is included in the article. An Sn3 version of the Westside Lumber Company in the early to mid-1950's. The setting is the woods of the Sierra Nevada mountains, about 120 miles east of San Francisco. The layout occupies a 30â€™ x40â€™ basement room. The layout is about 1000 square feet. Track work is hand laid, with about 30% dual gauge. The scenery is highly detailed, and about 98% complete. Motive power includes WSLC Shays, WSLC Heislers (both narrow gauge and standard gauge as per the prototype), a WSLC Porter, a Sierra Railroad Climax, an early Sierra diesel, one standard gauge Sierra Railroad 2-8-0, a WSLC Plymouth Diesel and a WSLC Railbus for passenger service into the woods. All engines are DCC with sound. Operation is at a relaxed pace, closely following the actual traffic patterns of the company in this time period. Three Town Shays work the delivery of empties from Tuolumne to Deadwood, while three Woods Shays deliver reloaded lumber from Deep Gorge to Deadwood. The standard gauge Sierra Railroad works the Tuolumne Drying Yards and the town. Work trains deliver oil, water and sand to the camps, while an excursion train brings visitors up to Camp 24 to have lunch with the camp crew and return to town in time for dinner. The primary objective of the operating scheme is for the engineers to have fun!